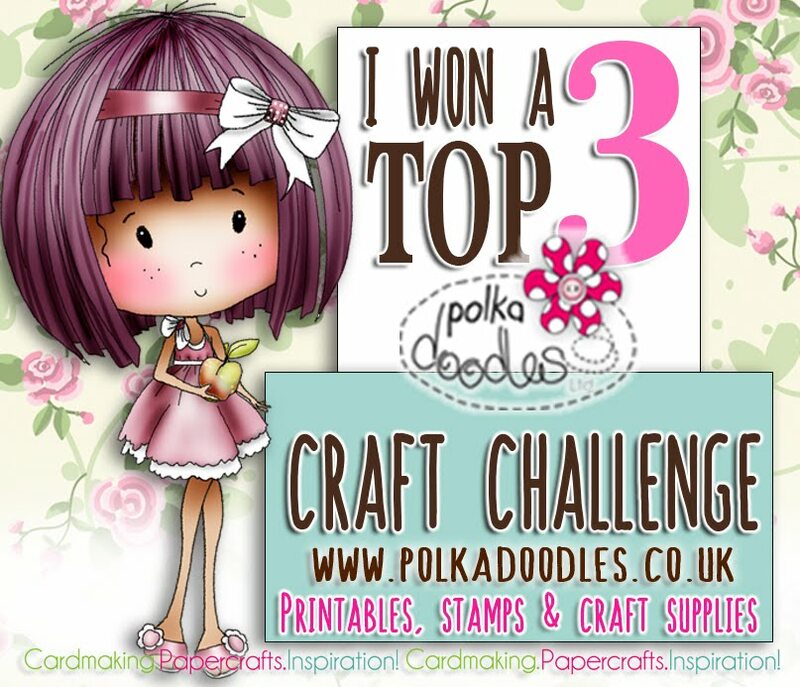 Welcome to another Polka Doodles challenge! 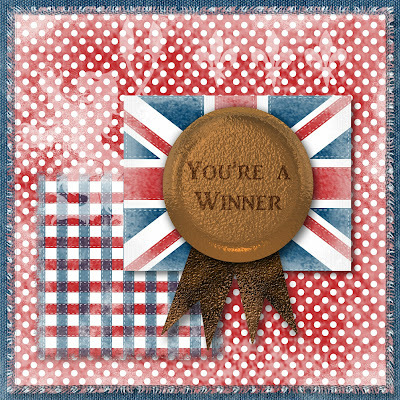 Before we get started we need to announce the winners from our Olympic Colour Challenge and Blog Hop. We actually had very few entries for this so we think you must all be on holiday - hopefully out of the country with all the weather we've had up to now! Please email Nikky for your prize and grab your blinkies from the sidebar - the first placed winner receives a copy of the brand new and very in demand Picknix CD (if you already have this please let Nikky know and she'll let you choose something else) and the second and third place winners an Emma Canning Download! Please remember to put your verification code and the challenge week in the subject field on your email. In addition, you must use the same email address to claim your prize as your challenge entry otherwise we cannot release your prize. So, onto this week's challenge! You'll notice that quite a few of the Design Team have used the same cute image - Taylor - Camping Day by Emma Canning but look how different she looks on each of the cards showing just how much fun you can have with these gorgeous images and there are loads more to choose from and we are about to add some more to the range! 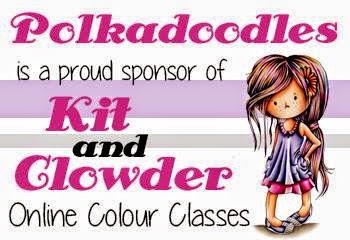 Emma's designs are exclusive to us at Polkadoodles and are proving a huge hit! Our theme for this week is Summer and just look at the inspiration to see just how many ways that there are to interpret this. We also have the fabulous first prize of a Studio 12 Picknix Collection 1 CD so what are you waiting for! NJ - For my Summer card I chose to use the Candy Doodles Collectors Edition CD. I used the cupcake from the cd. The digi is by Emma Canning and it is Millie Birthday. I have also used a Marianne Design Die LR0118. The pink swirls I made using fimo to look like swirly candy! Fabiola - For this Summer project, I've made a card, using Emma Canning digital stamp Taylor Camping Day. I also used a variety of papers from the PPC 3 Kit, and kraft paper from my stash. The flowers are from my stash and also the bling. I coloured my image with Copic markers. Nelly - Happy Friday to all, and yes its midsummer! ... isn't it? For my card I have taken the Sunflower image from The Sundae of Season's CD and coloured them with my trusted Promarker pens ...I incorporated this fab u lush image from the designer EMMA CANNING called "Summer Thank you" isn't she just Gorgeous!! again I coloured her using Promarkers, the leaf die is from MARIANNE DESIGNS .... flowers embellishments can be found HERE ...trimmed up with glitter and butterfly and ladybird embellies border lends to a perfect British summer looking day don't you think ? Patty: For my card, I used the lovely Summer from Emma Canning images, and some of left over papers that were on my desk (that I 'm trying to use up! ), added the border and the sentiment and voila!!! my card is done. I love clean & simple cards in which the image is the attraction..and this is a good example. JAN: My summer themed card uses gorgeous pastel papers from the 'Sundae of Seasons' CD, together with a fab little flower image from the same CD. The main image is an 'Emma Canning' design and she is very aptly called 'Summer' and has been coloured with my Promarkers. 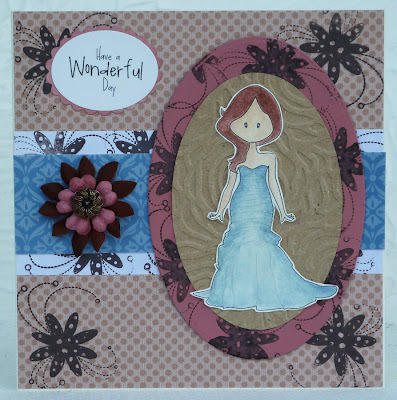 A collection of flowers accent the corner of the image and are enhanced with my favourite Marianne leaf die (LR0226). I also used a Marianne die (LR0191) to display the sentiment (which is from the latest Pen & Paper Circle stamp set).1) to display the sentiment (which is from the latest Pen & Paper Circle stamp set). Claire (Happy Days) - I've gone all retro today and used Taylor "Camping Day" for my easel card. The papers are from the All Around & Everywhere CD and the flowers are from the Sundae of Seasons. I used my computer to generate the sentiment before over printing the patterned paper. Kitty - Instead of bright summer colours I thought I would try soft muted tones for my card. The image is of course Taylor 'Camping Day'. 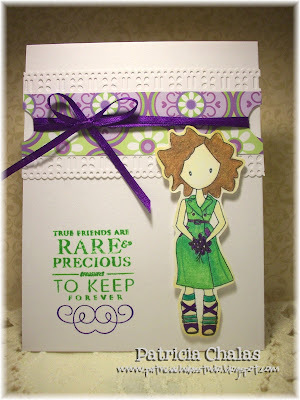 The papers are from Sundae Of Seasons and the sentiment is from Sugarplum Daisy CD. Claire - I too have used the lovely Taylor camping day image perfect for a scottish summer! Combining it with elements from the Picknix 1 Studio 12 cd. 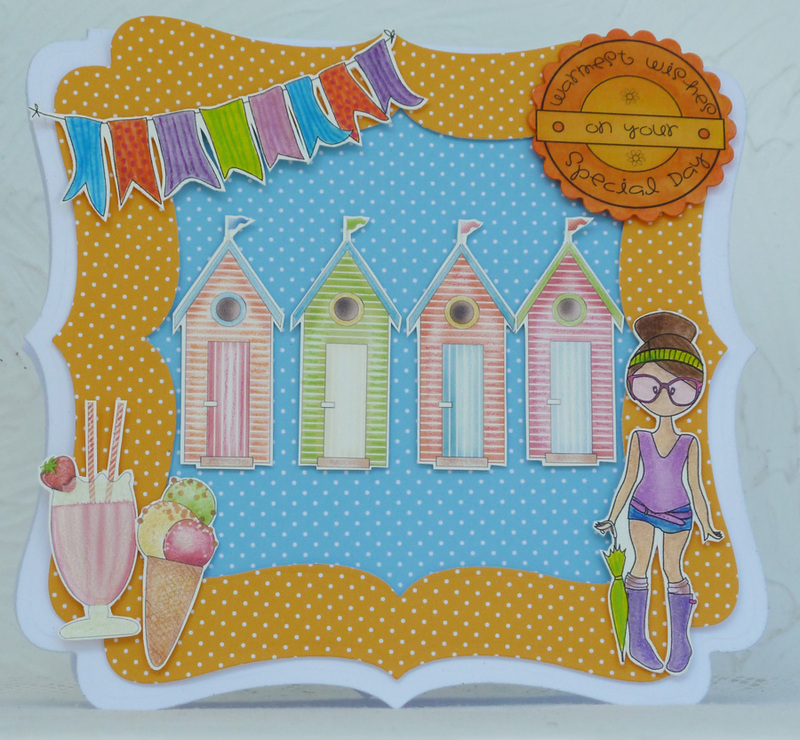 Emma - This week I have used the fab little bee from the Sugar Plum Daisy collection (My Fave) to make a summery exploding box. Shell- For my card I have used the fabulous image from Emma Canning she is called Summer and I thought she was perfect for this challenge, the papers and the ticket sentiment are from the Sugar Plum Daisy CD The huge flowers has been made with a die and the edges have been distressed and scrunched. Lou - For my summer card I've also used the cute Taylor Camping Day image and have coloured her up then cut her out and added her to an acetate panel along with the text and kite I made. 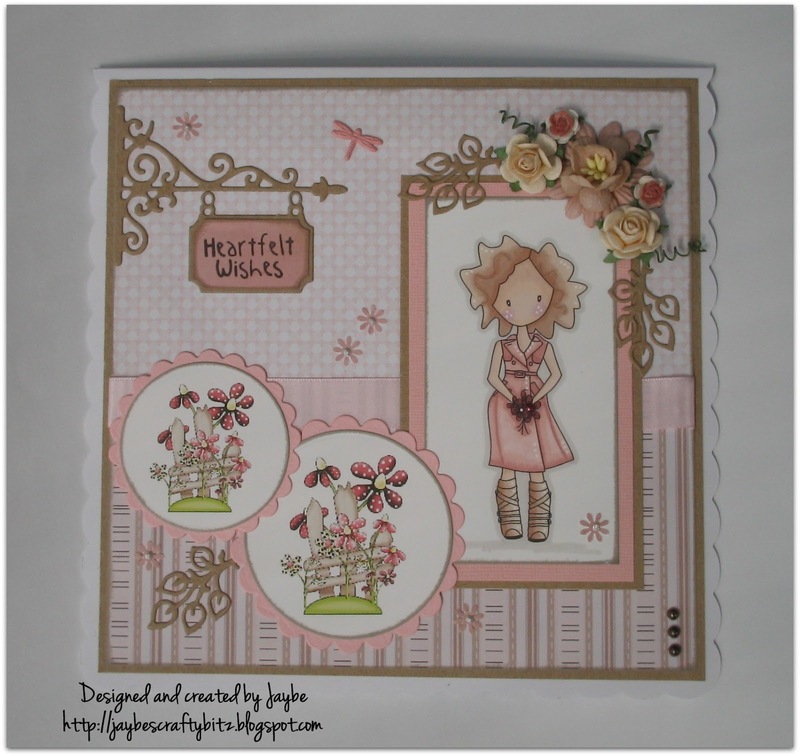 The background uses a paper and several of the embellies from Heavenly Garden kit on the Studio 12 Picknix Collection 1 CD. Fliss - To me, nothing says summer more than the beach, so although I too have used the Taylor Camping Day image, her brolly is a parasol and the wellies for wading in rock pools lol. I've made a shaped card with a large die and then added a matching shaped frame. 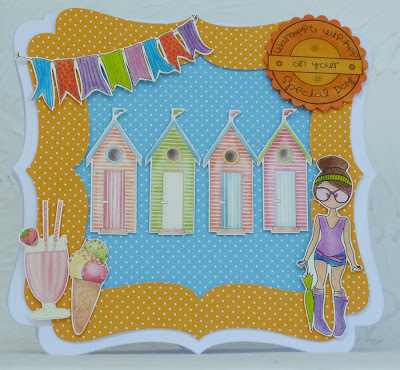 I've used papers and a sentiment from the Sugarplum Daisy CD, added beach huts and ice cream from the Sundae of Seasons CD and bunting from the Studio 12 Picknix Collection 1 CD. Colouring is done with Aquamarkers and Prisma pencils. We're looking forward to seeing your entries and please don't forget to check the rules to make sure your entry fits the challenge and requirements. It's Friday again and time for another challenge! Don't forget to watch Nikky on Create and Craft (Sky 671) on Saturday 11am and 4pm as she is launching a brand new cd!! Bet you can't guess what it is!! I've got Sky+ set so I can watch it back later on when the kids are in bed with a glass of wine. And I think some fudge......hmmmmmm!! Congratulations to you all! Kimbo, please email Nikky for your prize and you can all grab your blinkies from the sidebar - the first placed winner receives a copy of Paper Boutique Vol 3! Please remember to put your verification code and the challenge week in the subject field on your email. For the first prize winner, you must use the code given above to claim your prize otherwise we cannot release it. So get using all those bits and bobs that you just knew you could use! Stuck for inspiration, then have a look below at the Design Team's creations! The challenge runs until 12noon GMT on Sunday 29 July and please remember our rules! The first placed winner wins a download bundle from the store! Ruth: I've gone for an old favourite - the cupcake template from Paper Boutique Vol 3 and the green colourway. I've cut out all the elements and layered them up with foam pads, added some glitter glue around the edges of the cake and added a line of silver dots around the inside of the star. My recycling is the ribbon from a long gone box of chocolates and the brown card is from a sample Wedding invitation. 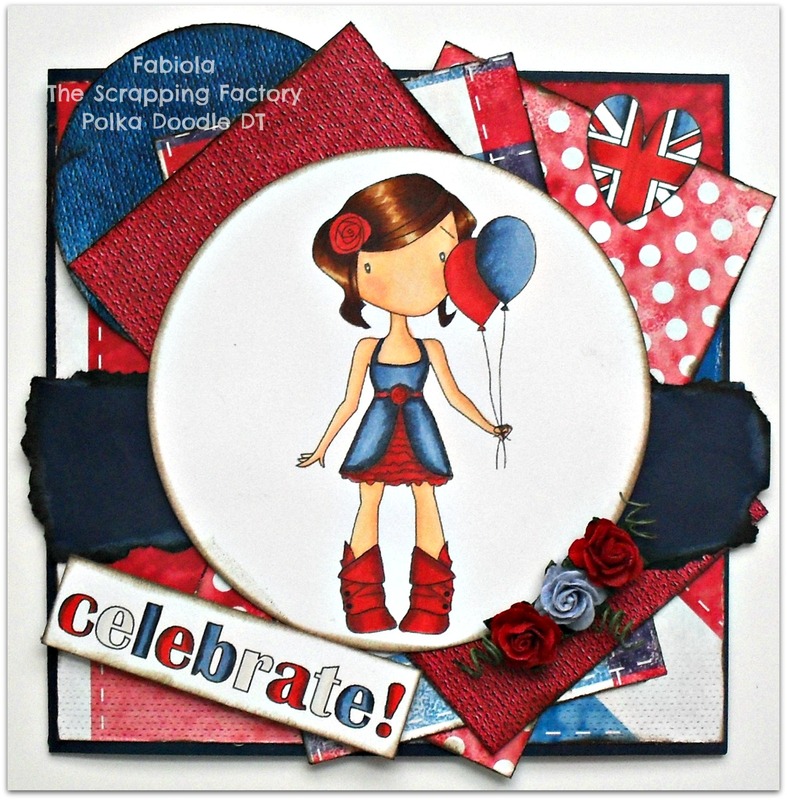 Shary - I have used one of Emma Canning's digistamps called Millie Birthday, she is available from the Polkadoodles online shop. She's been coloured with Copics. The papers are all from the Pretty Sweet CD Rom. The string is my piece of recycling, I've just coloured it with some tattered rose distress ink. Lucy: For this challenge, I used recycled brown paper. I spritzed it with gold and copper shimmer sprays. I stamped the image on to cream card with Neighbour Clear stamps. I coloured them with just brown Pro Markers. Fliss: I've hijacked the challenge this week as I love recycling and have made my card using the Paige Wedding Day image turned into an evening dress. My recycling is some greyboard which I painted and stamped having die cut an oval. I also used some die cut and embossed yogurt packing and some pretty printed packaging. 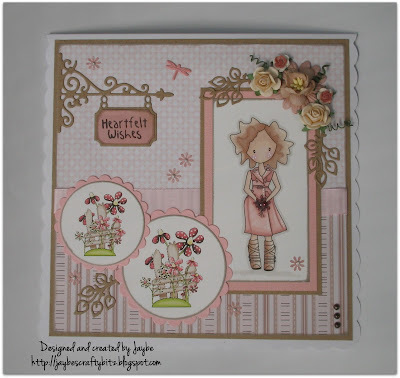 The backing paper is from A Double Sprinkle of Kraft and the sentiment Sugarplum Daisy. I did some stamping with the flourish flower from the Daisy Doodle stamp set. Daniele.....for my recycled item I used an acetate piece of packaging to create this snow scene Christmas card, this is also a sneek peek of the new Christmas Cd due out real soon, I made the trees and snowman small using gimp (one inch high) even the little snowman is layered up, I decoupaged his hat and scarf. It wouldn't be christmas without lots of glitter. Clare - I loved this challenge as I'm all for recycling. I regularly buy my two kitties cat grass as they are indoor furbabies. I used the box the grass came in as the base for my bookmarks then covered them with the lovely polka dot papers from the Pretty Tuff CD. I made three bookmarks so that I could use some more of the gorgeous girly images from Emma Canning. I used Millie, Paige and Summer. The sentiment is from Studio 12 Picknix Collection 1. I have coloured the images with Promarkers & used Brushed Corduroy Distressed Ink Pad around the edges of my work. I finished the bookmarks off with red Doodle Dewdrops. 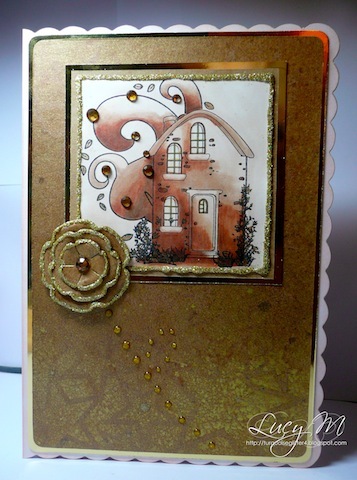 Anne - I've used Studio 12 Picknix collection for my card this week. Once I'd printed the embelishments I gave them a few coats of modge podge so they have a nice sheen before adding a couple of little recycled buttons to the finished card. Good luck with the challenge - closing date is Sunday 29 July at 12noon GMT. 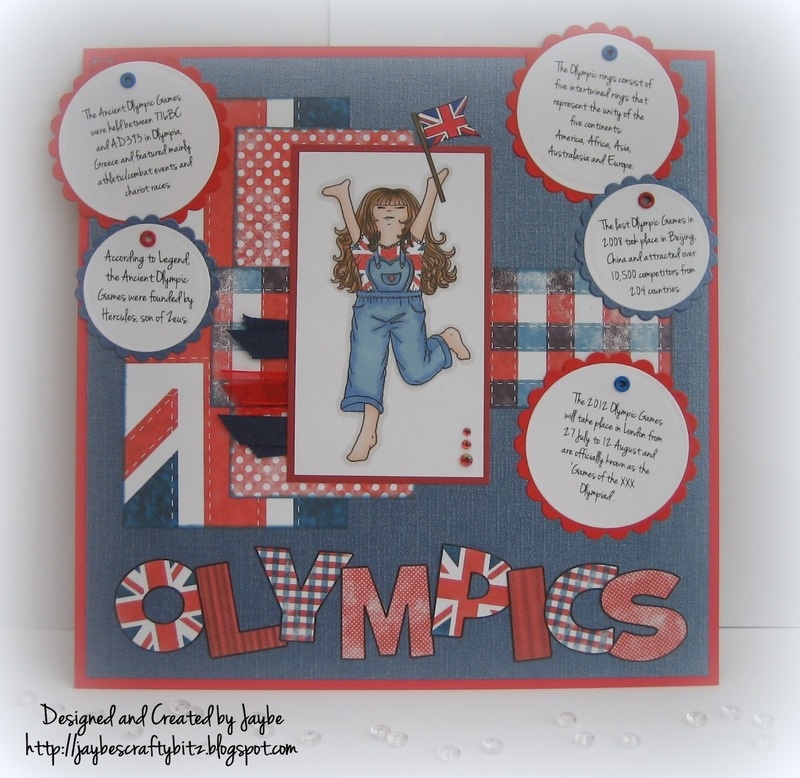 Week 28 Very British Olympics Red/White/Blue & BLOG HOP! 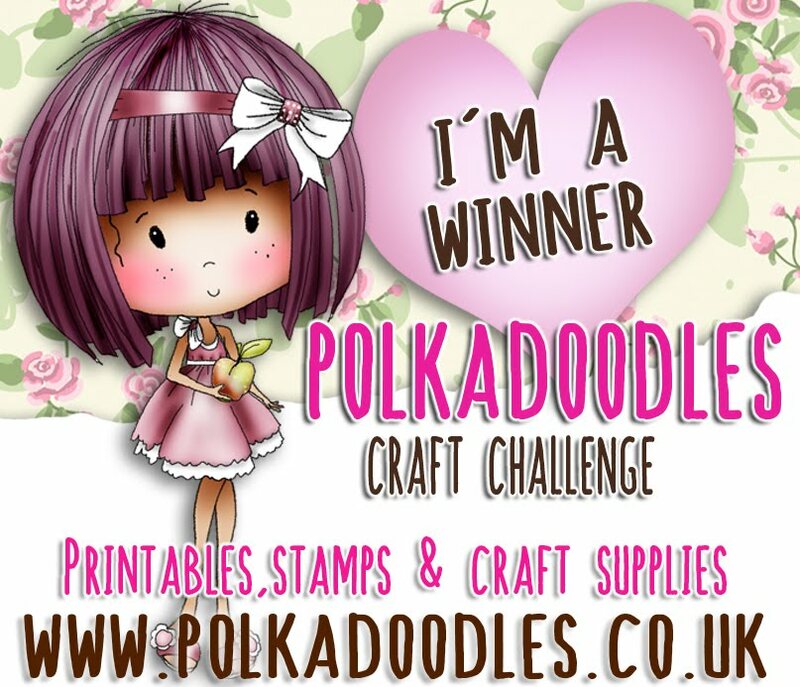 Welcome to another Polkadoodles Challenge and Blog Hop! We're hopping to celebrate the imminent start of the Olympics and have some very special prizes on offer to some lucky participants of the challenge and blog hop but please remember that you must do both to be in with a chance. We're sure you'd like details of the prizes and the lucky winner with receive a Studio 12 Picknix Collection 1 CD and the 2 lucky runners up an Emma Canning Download. So what are you waiting for - let's get the show on the road! Here's the list you'll need of all the blogs on the hop where you'll find details of the gorgeous creations from the Design Team all celebrating the Olympics and what it means to be British. If you get lost along the way then please do hop back here to be set back on the right track. Congratulations! Please email Nikky for your prize and grab your blinkies from the sidebar - the first placed winner receives a fabulous Emma Canning Download! Please remember to put your verification code and the challenge week in the subject field on your email. In addition, you must use the same email address to claim your prize as your challenge entry otherwise we cannot release your prize. Now for the challenge part which is to make a creation (whatever you like as you'll see some of the team have made something other than a card), using the colours Red, White and Blue plus something that denotes British for our Olympics - you can see the Design Team has gone very patriotic! Claire - I decided that I'd make a little door hanger for my daughters bedroom using the fabulous Millie Bedtime from Emma Canning and the Britannia Kit (Nikky kindly gave it away as a freebie on our Polka Doodle Dandies Facebook page) - after all you don't get anything more British than the Union Flag (well apart from a nice cuppa tea!!). Also I'm sure if sleeping was a sport that my DD would win hands down! Fabiola- I made a card as my creation. I used the gorgeous Millie Birthday from Emma Canning, I thought what better way to celebrate than with balloons, right? I also used the Britannia Kit. I loved and had so much fun making this project!!! 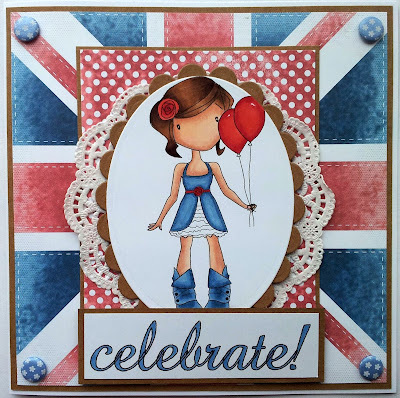 Nelly - Couldn't resist using circles as the main focal part of this card using Nestabilitie circle dies, I have cut images from The Pretty Tuff and Pretty sweet Cd's and design papers also from the cd collection and Polka Doodle Dandies Britannia collection. 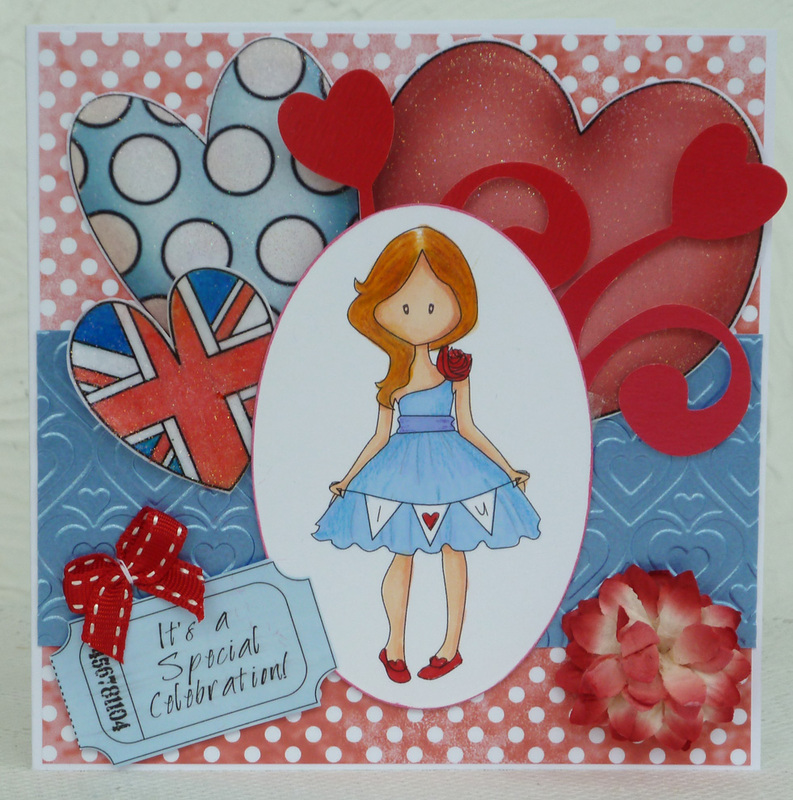 Fliss - My card for this week is a celebration one as I love Emma's really cute Paige "I Love You" digi. I've coloured her with Promarkers adding a little pencil for detail then die cut into an oval and inked the edges. 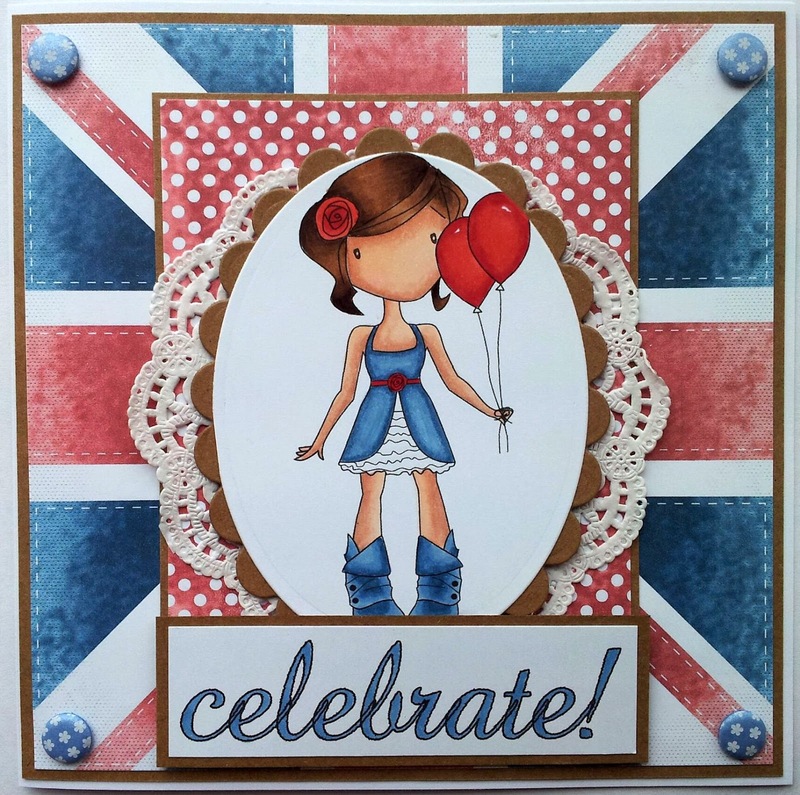 I've made a very layered card using background paper and Union Jack heart from the Britannia Kit, hearts from the new Studio 12 Picknix Collection 1 CD embossed with crystal powder for sparkle and a sentiment ticket from the Sugarplum Daisy CD. Kitty - For my card i used the gorgeous Emma Canning Mille Birthday, isn't she cute? Love her! 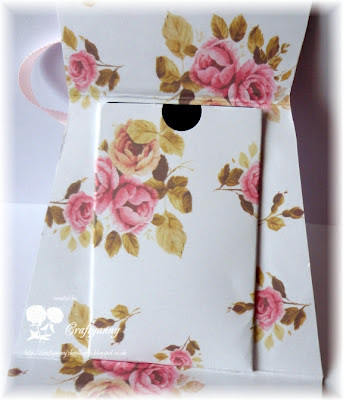 I also used the Britannia Kit, kept the design simple to show off the lovely papers! JAN: I made a scrapbook page for this week's challenge to record some 'Olympic' facts. The papers are from the 'Britannia Collection' designed by Nikky Hall. I chose an image from the 'Sugar Plum Daisy' CD as a focal point, instead of a photo and added a little union flag in her hand (also from the 'Britannia Collection'). She is coloured with Promarkers and her t-shirt is paper pieced with a scrap of union flag paper. The lettering was created on my pc and cut out of paper scraps left over from the background. I cut five circles (to represent the five Olympic rings) and added an Olympic fact to each one before matting them on co-ordinating scalloped circles. 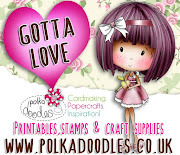 Claire I think we are all loving those lovely Emma Canning digi stamps this week. 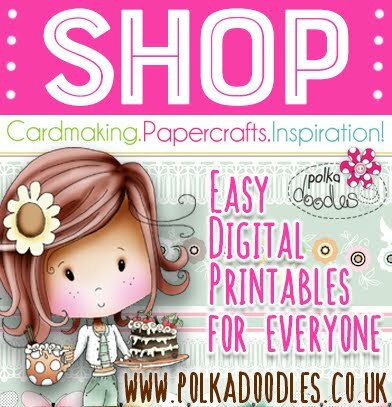 I have used Millies Birthday image available from the Polka Doodles store. Also incorporated the Britannia collection from Nikky to create my twisted easel card. Just a little doodled border with stickles and a lovely red velvet brad. NJ Hello my lovelies, well the excitement is mounting for the Olympics! I have chosen to make a card using the Not For Girls CD. I used various sporting elements from the CD to show the different sports. I made a medal using red, white and blue ribbons and a brass button! Lou: Well I seem to be copying NJ and I promise we didn't "liaise" ... lol. I have used only 2 papers and 1 topper sheet from the Not For Girls CD from the boxing section. The gloves and sentiment have been glazed to add further dimension and the stars were cut using a sizzlets die. Clare - For my easel card I used the gorgeous Paige Wedding Day digi by Emma Canning and the Britannia kit from Nikky to paper piece Paige's dress and to use for my backing papers. Patty - For my card I used Kiddo on bike from Pretty Tuff collection on a plain white base add a layer on red and on top a layer of blue both bordered, and the ribbon in between the layer tied a double bow with white and red and on top of the layers a added the images and the sentiment bordered with some blue and red stars. Emma - I did a digital card this time using the Britannia kit and all elements bar the central badge are Polkadoodles. Hope you enjoyed the inspiration and we can't wait to see your entries and meet you in the hop. You have until 12 noon on Sunday 22 July to participate. Good luck and please note that you MUST do the HOP to be eligible for a prize! Congratulations! Please email Nikky for your prize and grab your blinkies from the sidebar - the first placed winner receives a copy of the brand new and very in demand Pixnix cd! Please remember to put your verification code and the challenge week in the subject field on your email. In addition, you must use the same email address to claim your prize as your challenge entry otherwise we cannot release your prize. The first placed winner from this challenge will win a copy of Paper Boutique Vol 3 cd! Ruth: I've used an old favourite - Paper Boutique Vol 2 and cut out the pre coloured Santas (he's been lightly glittered!) with my Nesties and then made a template for the gift card with papers from the same cd. Pretty quick and easy to make - that is why there are 4! 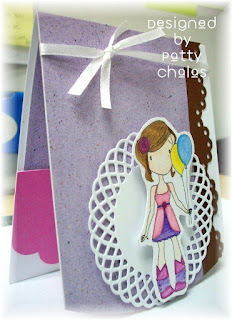 Patty: For this lovely challenge I used some papers purple dots left on my desk layered on to some white card. Used Emma Canning image Birthday Girl, coloured it with my Prismacolors pencils. Lisa - for my creation this month I've used my old favourites from the Back to Nature CD, the owls of course, and papers from Sundae of Seasons. 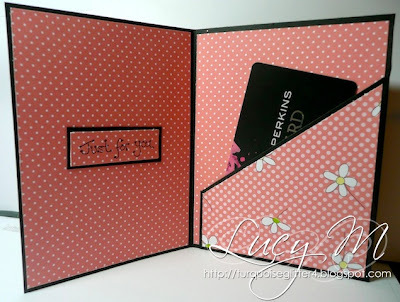 To see what's inside the giftcard you have to pop over to my blog as there isn't room here to show you all the photos. 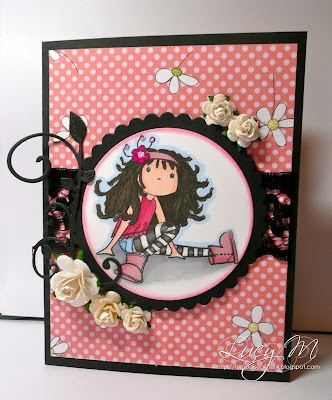 Lucy ~ For this lovely challenge I used papers from the Sugar Plum Daisy CD Rom, layered on to some black card. 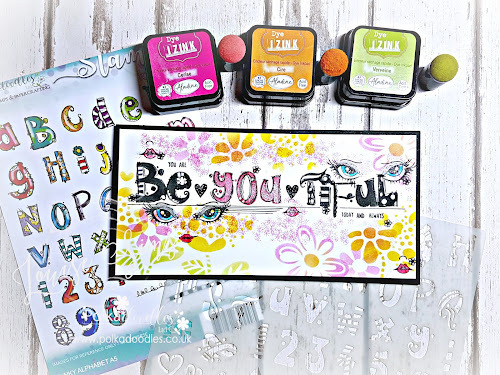 The image is stamped with the Gracie Fairy Flutterfly Rubber stamp. Coloured in with Pro Markers. Anne - These gorgeous papers are from the new Studio 12 Picknix CD . I just printed them straight onto white 320gm card turned it around and did the same on the other side. Daniele, for my card I used the really sweet bumble bee image from the Sugarplum Daisy Cd and added lots of gliiter .....cos I lurvvvvve my glitter, I did layer up parts of the image for added dimension, I made a pocket for the front of the card and popped in a matching tag, you can add a giftcard to the front or back of the tag. Shary - I've made a gift card holder that holds a credit card gift voucher. The papers are from Sundae of Seasons and I've edged them all with peeled paint. The image on the front is from the Pretty Sweet CD and I've coloured her with Copics. The sentiment on the inside is from the Sugar Plum Daisy CD and again I've used Peeled paint to colour it. I've added a little bit of ribbon and some gem brads to finish it off.